Microsoft's Surface RT scenario has gone from bad to worse. First it wrote off $900 million of unloved stock as CEO Steve Ballmer reportedly admitted that it had made 'a few' more tablets than it could sell, and now the company is being hit with a class action lawsuit for allegedly failing to notify shareholders of the device's paltry sales. The dispute came to light after US law firm Robbins Geller sent out a press release claiming that Microsoft issued 'false and misleading' financial statements for its third fiscal quarter 2013 ending March 21. 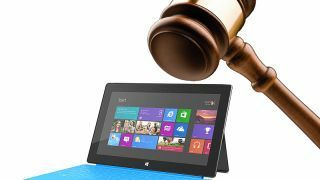 Specifically, the complaint alleges that although Microsoft knew that customer demand for its Surface RT tablet was low and sales were poor during the period, it continued talk up the device. It wasn't until Microsoft released its financial results for its fourth quarter and annual results on July 18 that it revealed it had taken a $900 million (£580 million) charge related to Surface RT "inventory adjustments". To make matters worse, it also revealed that combined revenue from Surface RT and Pro sales was just $853 million (£550 million), less than the charge it had taken on the former as the Pro performed better in the market. This caused the company's stock value to suffer its biggest decline in more than four years, plunging 11.4% to $4.04 per share. As such, Robins Geller is aiming to recover damages on behalf of anybody that purchased Microsoft shares during the third fiscal quarter from April 18 to July 18, as anybody that did so would have been none the wiser regarding its dismal performance. A Microsoft representative declined to comment on the class action suit. Despite the onslaught of trouble it's bringing, Microsoft is pushing ahead with its ARM-based Surface RT devices and is expected to release new products in both the RT and Pro families some time next year. Is Surface RT Microsoft's Zune all over again?